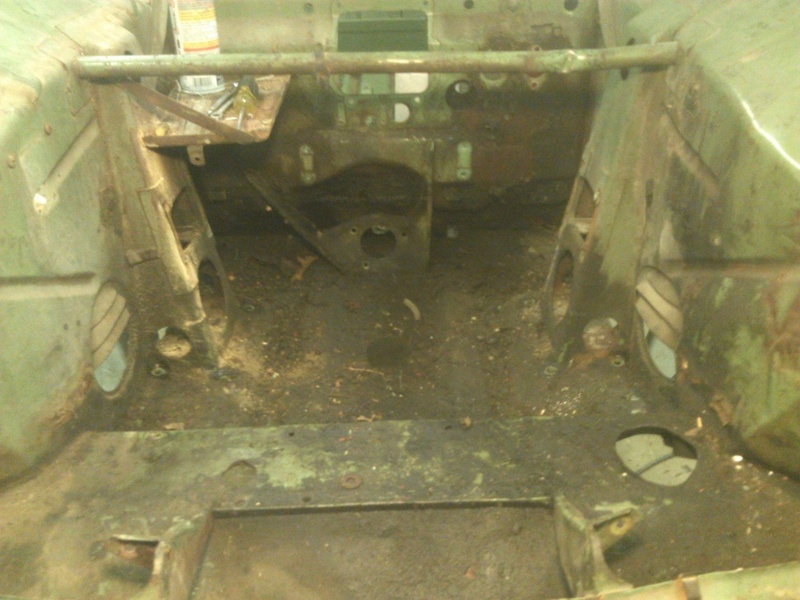 I finally have the Monte Carlo down to a bare bones body so I can start doing some actual restoration work. The photo to the right shows the bare bones body. 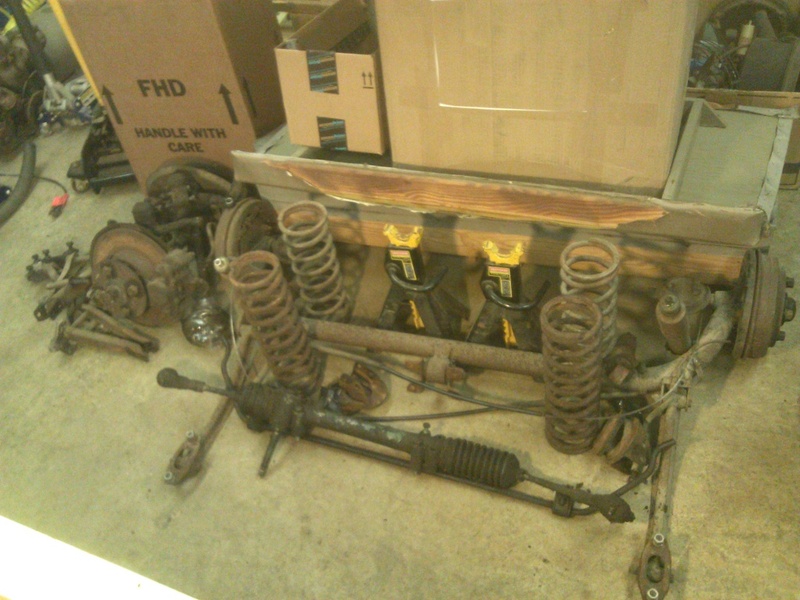 In summary, the suspension removal was simple and straightforward except for a few studs being broken due to my usual impatience. Also, the rear axle apparently took a bad sideways hit at some point in the cars life. 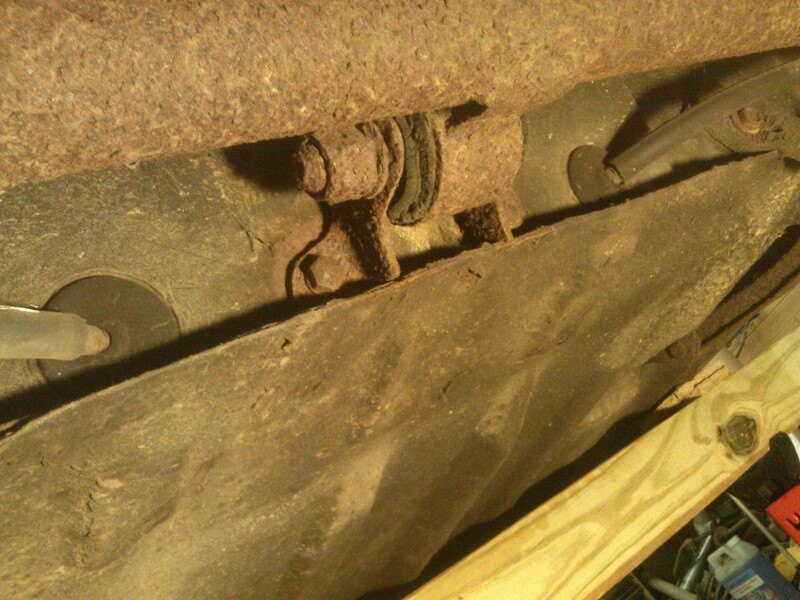 The left side spring support post punched a hole in the trunk wall which, left unrepaired, led to some excessive rust under the gas tank. If you care to know the step-by-step details with a bucket load of photos, please continue reading. 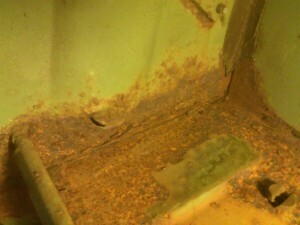 I was a little surprised to see the large amount of rust under the gas tank. While examining that, I found what at first look seemed to be a ventilation hole. It seemed out of place, and I noticed the rust started directly at that level on the sidewall, indicating water splash had been entering there for quite awhile. 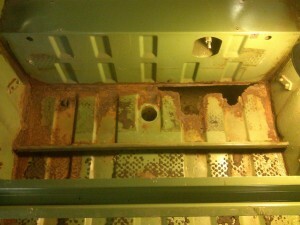 A closer look, as shown in the closup photo shows that the hole was punched, leaving the punched metal still attached as an upturned flap. The photo to the right shows that the strange hole is in close proximity to the post to which the lower spring plate is mounted, and the profiles are an exact match. Realizing now that the rear axle once took a bad sideways hit, I was immediately concerned that the car body may have been damaged near the axle center bearing which took the brunt of the force. I was relieved to see that the body was straight and undamaged in that area as shown in the following photo. 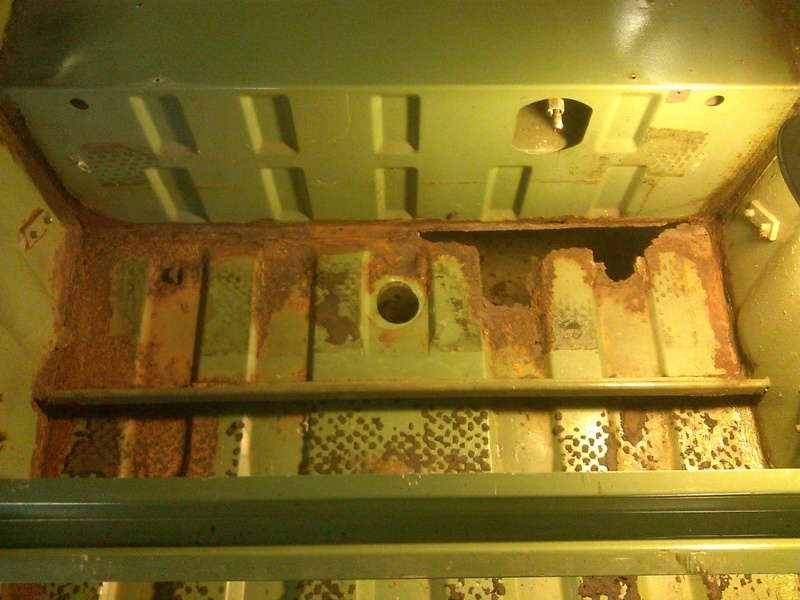 Fortunately, the rust caused by incoming water splash didn’t extend to the gas tank itself as shown in the bottom and end view photos. Removing the rear suspension is a simple procedure. 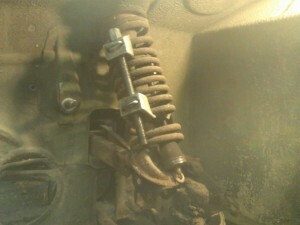 The stop straps were removed to allow the axle to drop to the limits of travel of the shock absorbers. 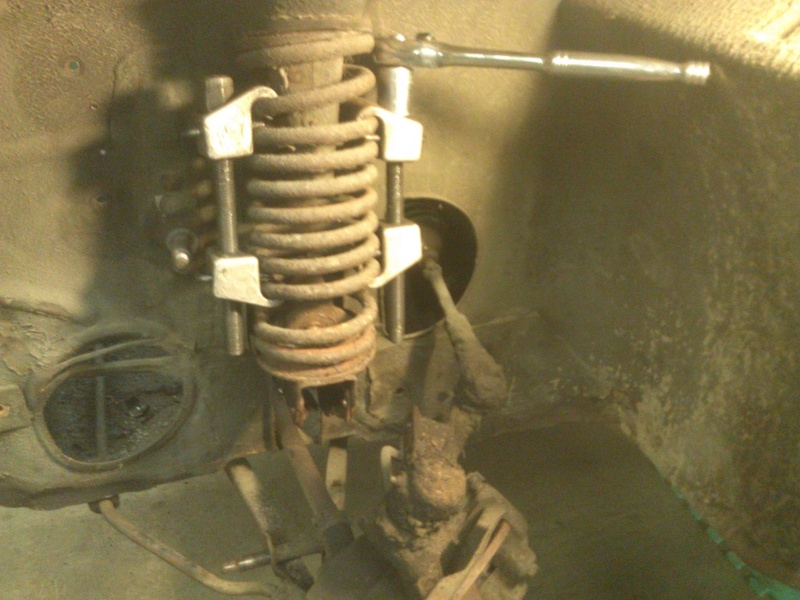 Unfortunately, the shocks didn’t allow quite enough travel to permit easy spring removal so I placed jack stands under each will and detached the shocks at their upper mountings. After this, the springs could be lifted out. 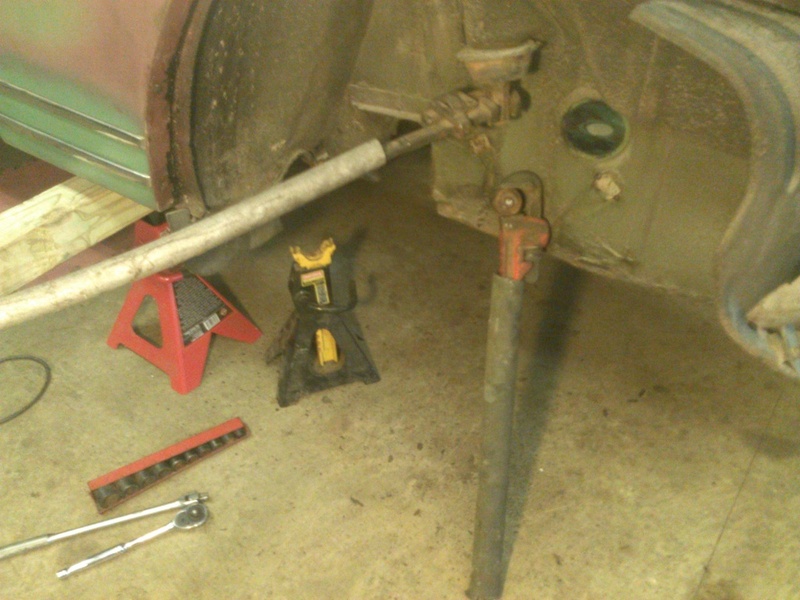 The jack stands weren’t really necessary up to this point, but are necessary when removing the mounting bolts. 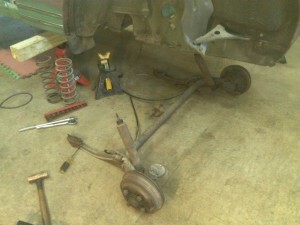 First, the center bearing is unbolted, then each side link is unbolted, and the whole assembly can be removed. I didn’t detach the handbrake cable because the cables were detached inside the car and simply pulled out. This photo shows the whole assembly removed. The first step to removing the front suspension is to remove the upper rubber bumpers located inside the coil spring. A good pair of channel-lock pliers or vise grip pliers usually does the job as shown in the photo to the right. When unscrewed, just let the bumper drop to the lower plate and leave it there. 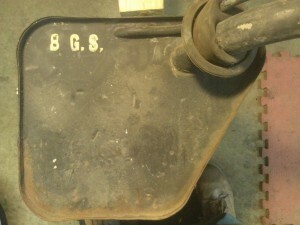 These have never given me a problem, but the shop manual has a suggestion if they are too rusted in for removal. 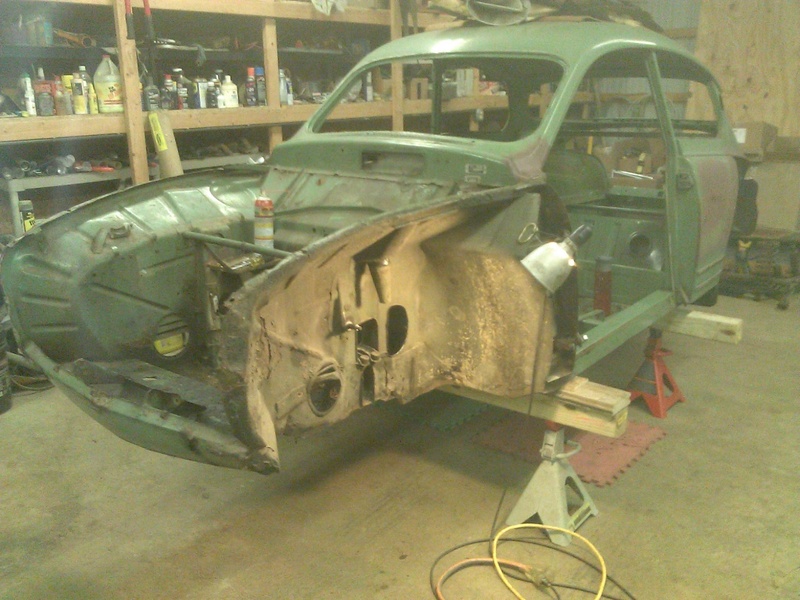 When the upper bumper cannot be removed, the shop manual suggests cutting out the two lower bumpers located under the upper wishbone assembly. 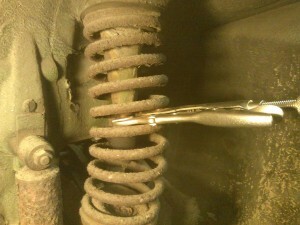 This will allow the wishbone to drop further for easier spring removal. However, this alternative would have required compressing the spring first in order to take pressure off the lower bumpers. 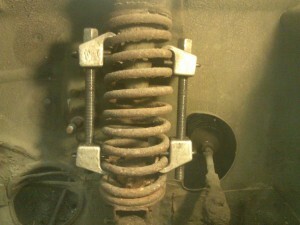 For compressing the spring, I use a pair of strut spring compressors. Mine aren’t the best but they get the job done safely if used carefully. If you can get hold of a compressor like Saab special tool number 784082, it will make the job much safer. 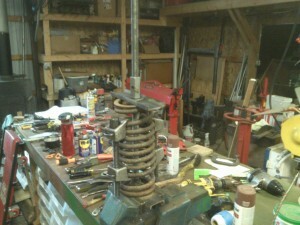 The photos to the right show the spring compressors installed, and then with the spring compressed. It is only necessary to compress the spring enough that a small gap develops between the top of the spring and the upper plate. 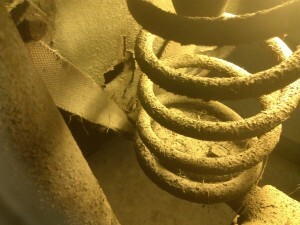 Sometimes the spring sticks, and a little pry with a screwdriver loosens it. 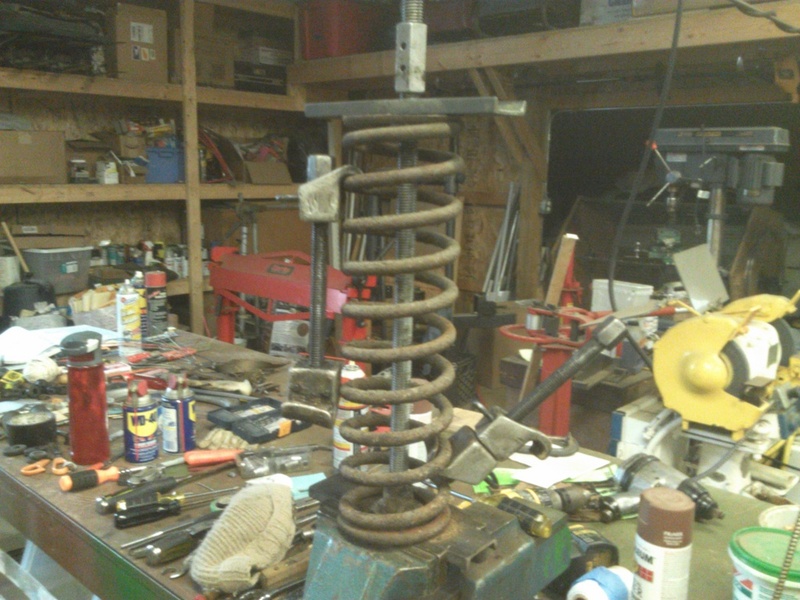 You won’t be able to remove the spring just yet, but it should feel loose when you wiggle it. 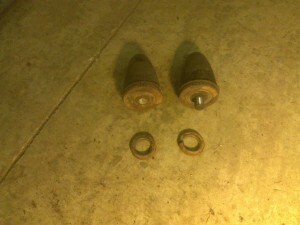 Once the spring is compressed, it is safe to remove the two bolts holding the upper ball joint in place. 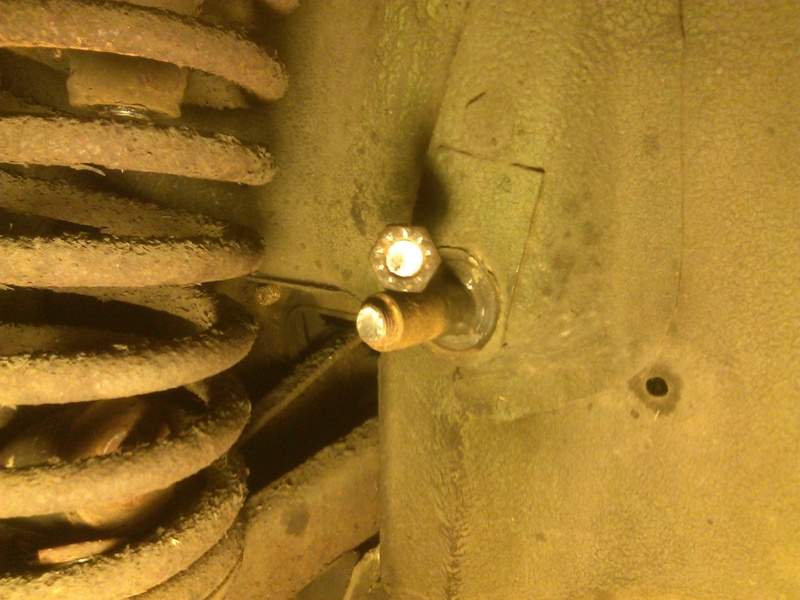 I removed the nuts prior to compressing the spring, but I left the bolts in place. DO NOT remove these bolts prior to compressing the spring or bad things can happen. The first of the sequence of two photos to the right shows the ball joint removed and moved out of the way. The second photo of the sequence shows the spring support plate being slid off the control arms and the spring coming off with it. The rubber bumper now falls out. 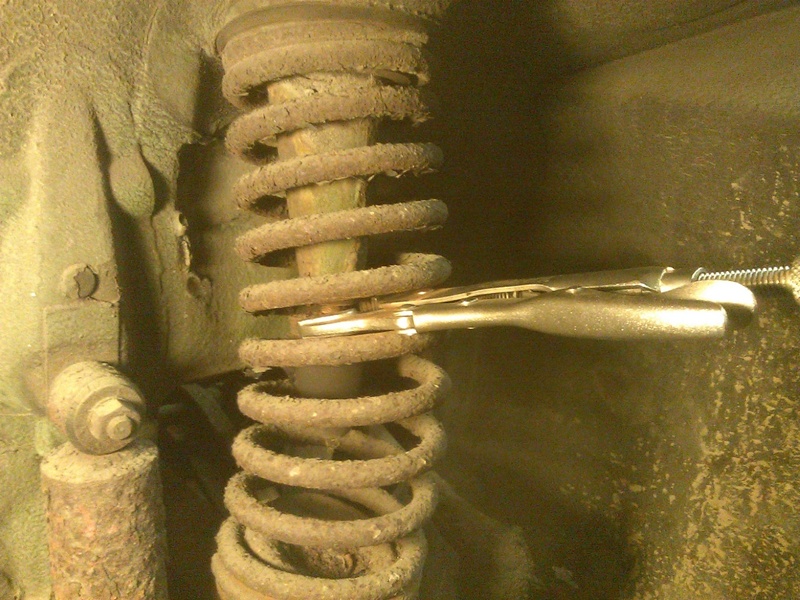 It’s nice to have the spring compressed and off the car, however, the compressor tools don’t expand enough to allow uncompressing the spring. For this, Saab used special tool number 784081. I cobbled up my own version with some 5/8″ threaded rod, hex nuts, washers and strong U channel. 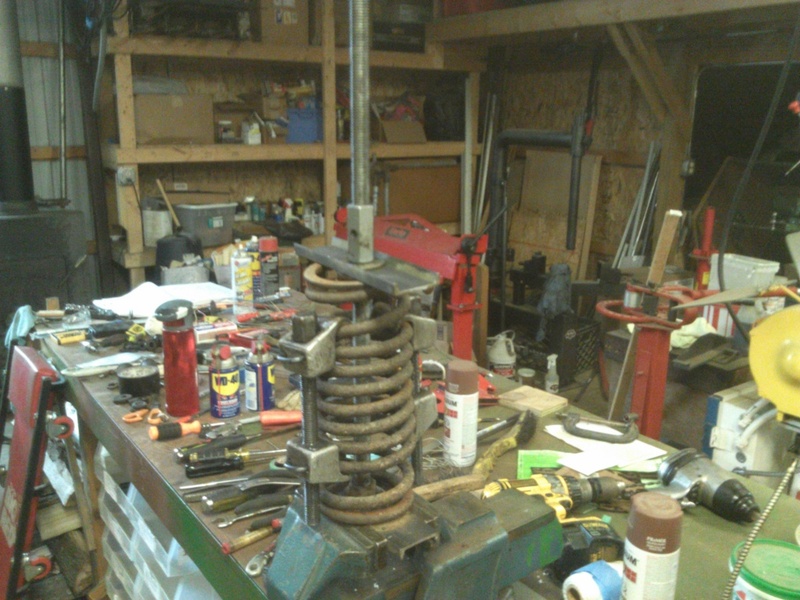 I mounted my cobbled version of the tool in a vise, set the compressed spring assembly on, compressed the spring just a little, loosened the two outside spring compressors completely, and then uncompressed the spring, removing at least one end of the outside compressors as soon as I could. The sequence of photos to the right illustrates the procedure. It’s time to breathe easy and have a drink when this is done. 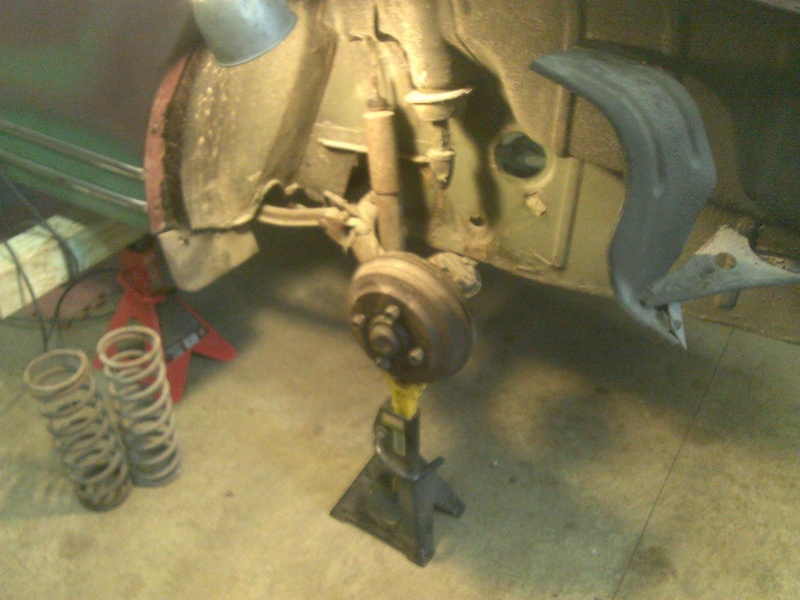 With the springs removed, all that was necessary to pull the hub was to pop the tie-rod ends loose and unbolt the lower ball joint. 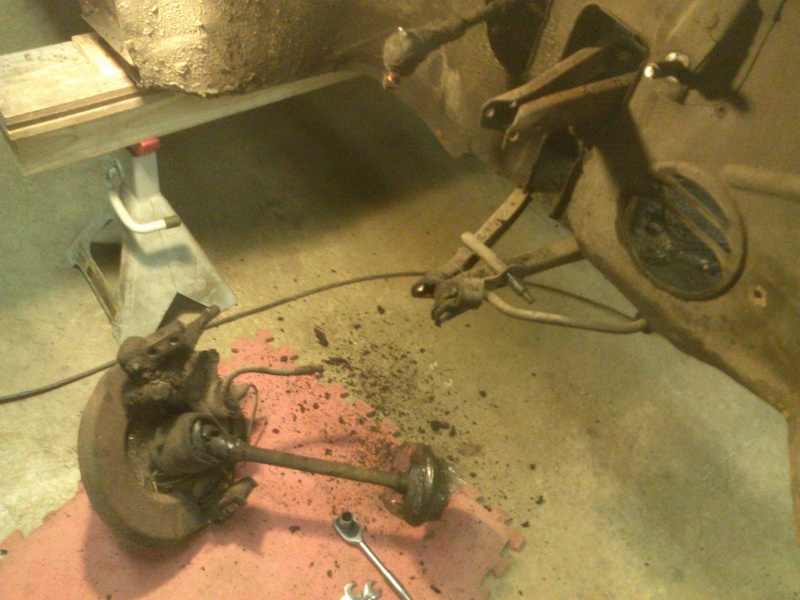 I temporarily put the upper ball joint back in place for support and popped the tie-rod end loose. I used a special tool that I’ve had for years and I highly recommend these over more brutal methods. You’ll see in the photo to the right that I left the castellated nut in place, unscrewed to maybe 1/16″ beyond the end of the stud. 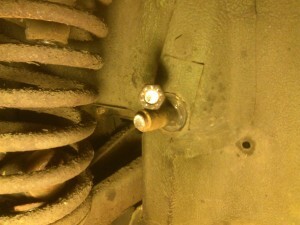 This creates a little pocket to keep the tool from wandering off the stud, without damaging the nut. 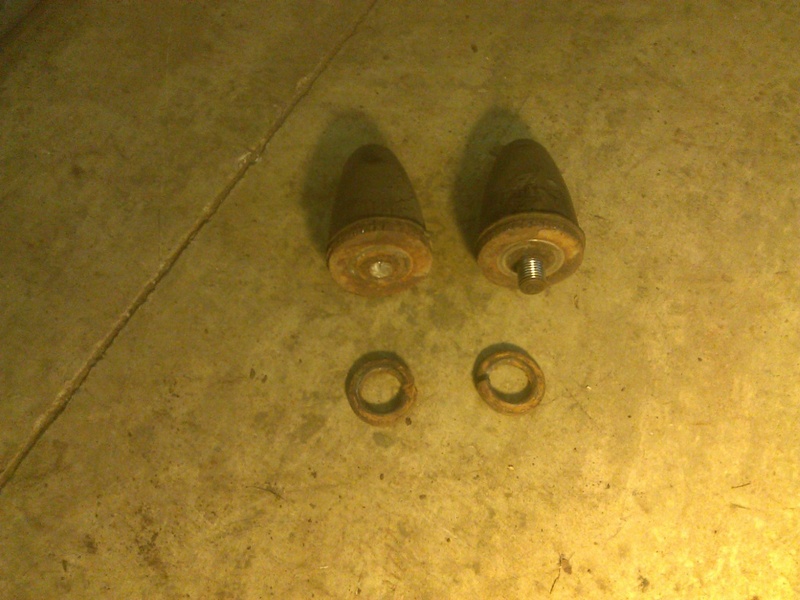 After parting the tie-rod end and unbolting both ball joints, I was able to remove the hub assembly which you can seen in the photos, on the floor. You may notice that I slipped zip-lock bags over the inner universal boots. This keeps the caps on the drive shaft in place which then keeps the needle bearings from falling out. Sandwich bags were a nice snug fit. Removing the sway bar, upper and lower wishbone control arms, and the steering gear were now trivially easy tasks, leaving me to ponder the messy engine compartment in this photo. This is the week’s harvest. My first mistake this week was to use cheater bars for removing a stubborn rear upper bumper. It would have been better to give up on a clean removal. 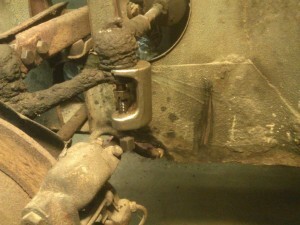 I could have cut the rubber off and used heat to loosen the rusted stud. 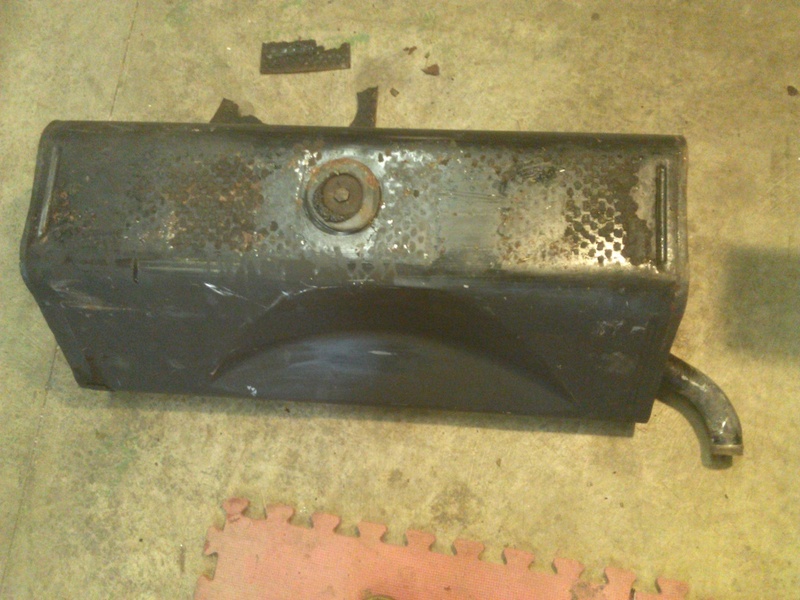 Instead, the cheater bars broke the stud off of the bumper, and I now have extra work to do in removing the stud. Not a big problem, just shouldn’t have happened. I’m a slow learner. I didn’t use a cheater bar here, just too much force, and I broke the right, front, upper shock absorber mount stud off. More unnecessary work down the road. This is a bigger problem, and I’m not sure of the easiest fix. The driver-side mount looks to be in better shape. Since I am scrapping the driver-side wheel housing, and since the mount looks symmetrical, maybe I can just do a replacement. We’ll see, unless someone has a better suggestion. I will be drilling spot welds and removing the driver-side front wheel housing and the trunk floor. It may take awhile, but I will post again when that is finished. Love the blog. Very neat and lots of detail. Can’t wait for the next updates. I read it like an interactive adventure. Thank you for a proper blog.